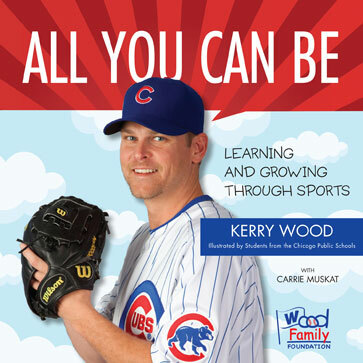 In this colorful volume, illustrated by elementary school students from the Chicagoland area, veteran All-Star pitcher for the Chicago Cubs Kerry Wood shares the valuable principles he’s learned throughout life. The importance of education, working hard to attain goals, building character, maintaining integrity, and accepting responsibility are just some of the life lessons he shares. Aimed at any young dreamer looking to develop a successful personality—whether they want to be president of the United States, the best teacher in their school, or even a starting pitcher for the Chicago Cubs—Wood provides advice for every youthful go-getter. Sharing his own highs and lows, both on and off the baseball field, he also stresses the importance of family and friends, the positive power of laughter, and doing the right thing. Kerry Wood is a major league pitcher who has played for the Chicago Cubs, Cleveland Indians, and New York Yankees. He lives in Chicago. Carrie Muskat is the author of Banks to Sandburg to Grace: Five Decades of Love and Frustration with the Chicago Cubs and the Chicago Cubs Cookbook. She lives in Chicago.